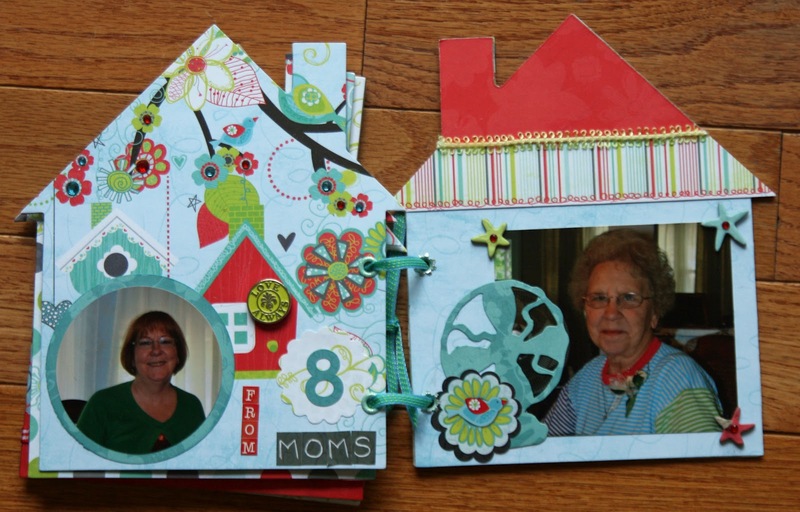 I warned you last month that after I found out how great it was to make a book with coordinated papers and embellishments that my altered item might be a book every month. Two months doesn’t always make, but the BoBunny Alora line had such cute items I couldn’t resist making a book as a thank you gift. My aunt included three extra Moms, who weren’t going to be with their children on Mother’s Day, in the celebration that she was having with her kids. 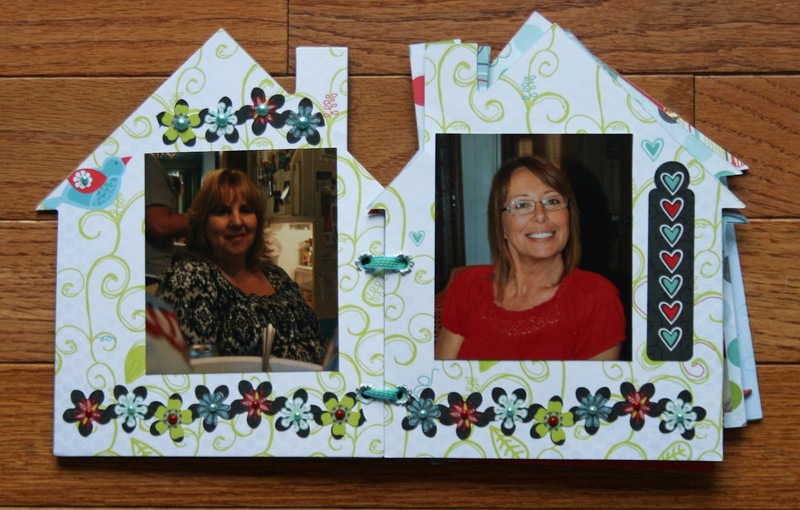 A book with some pictures of each Mom seemed a great way to say thank you. I encourage you to take a look at the larger dies available at ScrapbooksPlus for you to use. You can use them while you’re at a crop at no charge. 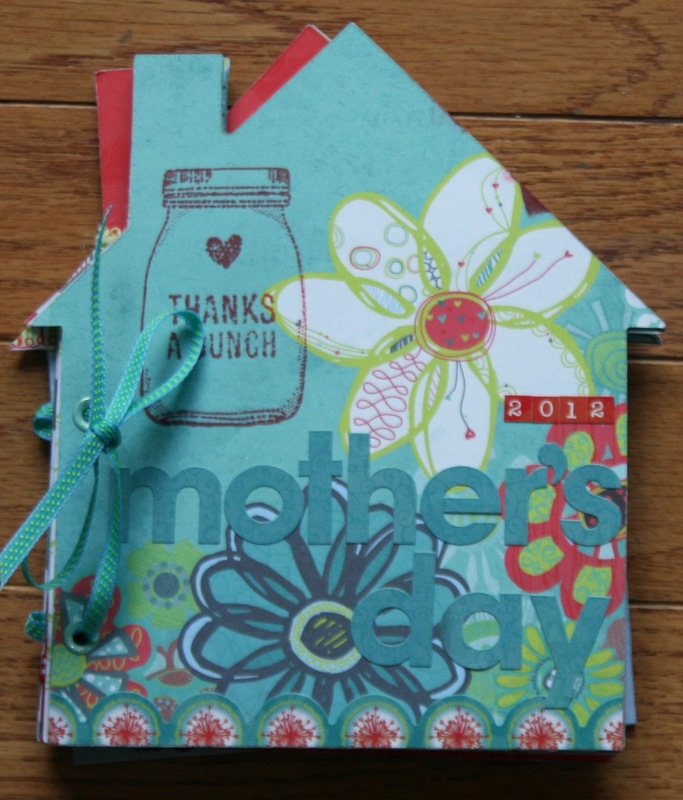 During non-crop hours, use of the room and all the tools (including dies) is free if you spend $5.00 . You can buy the chipboard you need at the store. Another advantage of cutting your book at the store is you only buy what you need. 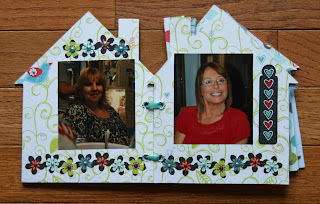 I punched holes for the ribbon to hold the book together with my Crop-a-dile and inserted We R Memory Keepers Eyelets. Not only do they keep the holes from ripping, but they add a bling. The turquoise ribbon that I used to hold the book together is a bit shimmery as well. 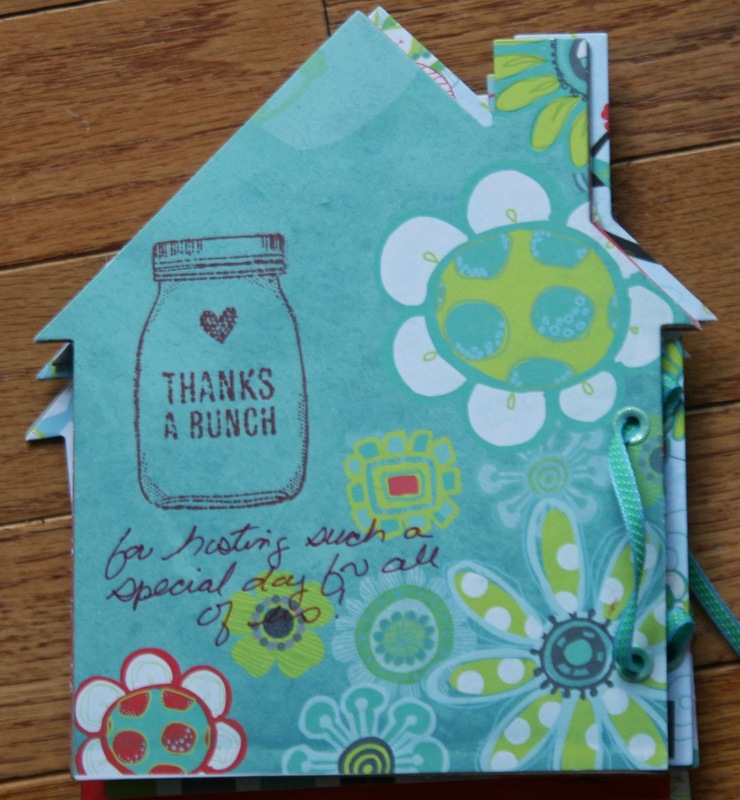 On the front and back cover, I stamped “thanks a bunch” and a heart inside a jar with a stamp available at Scrapbooks Plus. 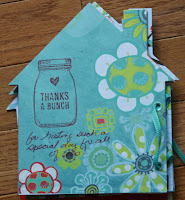 (The stamp includes some other cute items you can include inside the jar.) On the back cover, I wrote below the jar what the “thanks” was for with a pen, making the book like a thank you card. I decorated the covers and pages using letters, borders and designs from ComboStickers, Tiny Type Cardstock Stickers, Alora Brads and Alora Jewels. The Alora Jewels are practical because they include rhinestones and pearls in a variety of sizes. I love using them for flower centers. On one page, I used a flower border sticker and put a jewel inside every flower. 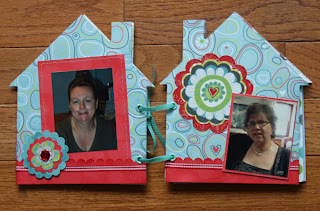 I found two more great ribbons at ScrapbooksPlus to use as accents in the book. And I cut out Alora papers in a variety of shapes to add to the pages and serve as photo mats. I especially like the alarm clock and fan cut with the Tim Holtz Movers & Shapers dies. I think my aunt is going to like this a lot better than the usual thank you note. And as I’ve discovered, if you simply buy paper and embellishments from the same line, you can make a book quickly. You can choose from pre-made shapes of chipboard and cover them with paper, make your own shapes as I did or simply use a square or rectangle shape. Whatever shape you choose, I’m confident the recipient will be happy.